The Bird Center is staffed by a small group of dedicated volunteers who care for and rehabilitate injured and orphaned wild birds. I've always liked birds, having grown up with parakeets. Several years ago, I became familiar with the Bird Center through Friends of Wildlife, when a sparrow flew into my glass door. It turned out to be fine, but some time later, I found a baby starling who fell out of its nest (twice--the first time it looked OK so I put it back, the next time, not so much and it unfortunately died later at the Bird Center). I've donated flowers for their injured hummingbirds and in the summer of 2005, I volunteered at the Bird Center. I mixed up formula, cut up fruit, fed formula to baby birds with eye droppers, caught any birds that escaped from the cages (which I was fairly adept at, based on my childhood experience, and could do by hand whereas others used nets), cleaned cages, and sorted live mealworms out of their packing material (this seemed to gross everyone else out, but I was fine with it). Brawk brawk BRAAAWK brawk squack squack flutter escape from cage chase chase chase return to cage brawk brawk brawk BRAAAAWK brawk brawk BRAAAAAAWK. That summarizes my first volunteer experience at a bird rescue center. I fed young birds with eye droppers (many, many, many birds--as soon as you're done with the row, the ones at the beginning are hungry again!) and cleaned out cages. Baby birds look nothing whatsoever like their adult form, especially not their mouths, which have to be about three times the size of their body! It was really interesting seeing baby versions of robins, starlings, and other birds. The center is understaffed, underfunded, and overworked. I got there by 6:00 p.m. and left at 9:45. My back hurt. My feet hurt. I was tired. The whole experience was tiring. Then I dreamed all night of baby birds with wide-open mouths and never-full stomachs, and still saw those images as I awoke. I'm looking forward to going again. In other news, I've sent off two sets of seeds for my seed swap today. I ended up being a little OCD and put together over 30 seed packets to start off each group. I even braved steadily falling snow during a winter storm advisory to go buy a printer cartridge! (OK, so I like driving in snow in light traffic, I confess!) I added some kind of cool and unusual seeds including rattlesnake master, kiss me over the garden gate, Swiss kale, a bunch of varieties of heirloom tomatoes, and clarkia. thanks for your comments - I'm still new enough to blogging to get excited when I get a response!!! Yes, I'm very lucky - firstly to have a Himself wot digs (although not very often and mostly under sufferance! )and to live in such a beautiful part of the world. Most people don't realise how gorgeous it is here - we don't tell the southerners about it in case they want to move up here and make it too crowded!!! The 'nutty gnome' name came from my daughters - my gardening activities have long been referred to by them as 'gnoming', and the 'nutty'bit.....well, I guess that kind of speaks for itself! I love your seed swap idea - I'd like very much to join in that, so I'll get myself organised...! Hi Monica, you are so funny! I loved the play by play of your volunteer bird center experience, and am in awe that you can not only sort mealworms buy catch escapees with bare hands! What a woman! I am working on getting my seeds in little packets and have some good ones too, thank you for doing this! What a great thing for you to do (and that there's a facility to work in near you!)!! You are good to swap seeds... a great idea. Your love of birds comes shining through your post Monica. What is the bird in your photo? It's not one I recognise. Happy to meet you. Sorry, the seed swap deadline has passed and the swap is already underway. Maybe next year! VP did say she had a lot of extra seeds, so maybe an English swap is due! Well, these birds were used to human hands--feeding them and cleaning the cages, so catching them by hand isn't as hard as it would be for wild birds. Still, it does take some intuitive actions, something I'm normally not at all good at, so I was quite pleased with myself, I admit! My area also has a center especially for raptor rehabilitation! 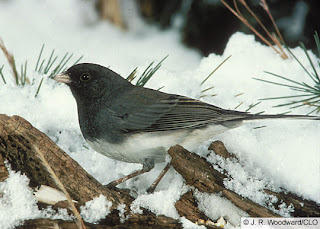 That cutie is a black-eyed junco (Junco hyemalis), whose winter range is North America. I love its dark expressive eyes. Hahahaha, I love the B.B. writing with the "looking forward to going again" frase! There is a little wren (Zaunspecht) in my garden which I simply adore and on two occasion I spotted, well heard him first, a jaybird (Eichelhäher). The latter doesn't really live here as he's a woodbird, but it was gourgeous seeing him! I've never heard of an organization for injured wild birds--what a great idea! Occasionally I'll see what appears to be an injured bird here, and I have no idea how to help it. All I can do is make sure it's out of harm's way of the cats. Monica..thank you for the kind comment on my drumming downy...I liked her too. I love that you volunteered with the birds..I would love to do that..my health won't let me. But what an experience you had..
That is hilarious. Brawk brwak BRAWK!!! I'll have to think about volunteering at a similar place locally. Thanks for the inspiration and the giggles. Wow ! You're a busy women. By the way...perfect pic of the Junco. I did go several times that summer, but since then I've only donated flowers for hummingbirds and monetary donations. Wildlife rehabilitators sometimes work/volunteer individually, not as an organization, and even wildlife/bird rescue groups tend to be understaffed and underfunded, and most of their "man"power goes to helping the animals, not generating publicity. A Google search for "bird rescue" or "bird rehabilitator" and "Illinois" will likely get you some local info. "Rambling" reminds me of an old Steve martin routine I had memorized in junior high school, lol! I did enjoy volunteering with he birds, even though it was tiring as you're standing/moving the whole time and it's a hard cement floor.